I should preface this post by saying I am not the biggest fan of mushrooms. In fact, I'm no fan of mushrooms at all. Ever since I was a kid, I've avoided them like the plague. Something about eating fungus just never appealed to me. So when a package from Origins arrived in the mail full of 'Mega-Mushroom' skincare products, I confess I was a bit apprehensive. 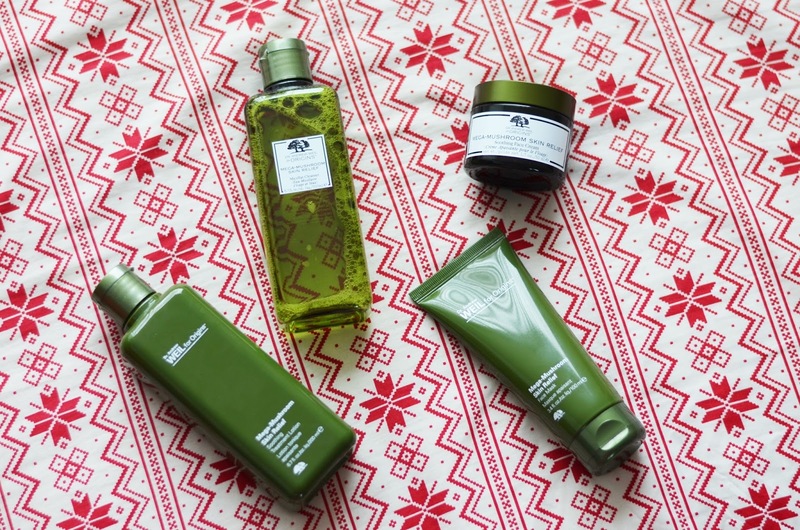 But after being introduced to Origins earlier this year with their GinZing skincare collection, I wanted to give them a shot. So I held my breath, and gave them a try. And you know what? I was pleasantly surprised! Maybe all mushrooms aren't bad... especially if they're helping to relieve your skin. And that's exactly what these skincare products do. The so-called 'Mega-Mushroom Man', Dr. Andrew Weil has collaborated with Origins on this collection. Dr. Weil believes that inflammation is the root cause of visible skin concerns like irritation He also believes that mushrooms have the power to fight irritation, which is what spurred the creation of this new collection of Mega-Mushroom products. In particular, it's all about the Reishi Mushroom, which has been known to help calm, comfort and relieve visible redness in sensitive skin. So if you generally suffer from irritated skin, these proven irritation calmers (aka mushrooms) will do the trick! Plus, Dr. Weil donates all of his after-tax profits from royalties from sales of their products directly to the Weil Foundation, which it uses to make grants to advance Integrative Medicine! Keep reading below to see my thoughts on 4 of the Dr. Weil for Origins Mega-Mushroom products. I have been using this face cream non-stop. Every morning. Every night. I love it. When I first tried it on, I immediately recognized its scent, but I couldn't place it. I literally sat down, just sniffing the container, trying to figure it out. It took me about 15 minutes, but it finally clicked: it smells exactly like Thrills chewing gum! If you have no idea what I'm talking about, it's a Canadian brand of gum that tastes kind of like soap. I know, that sounds totally bizarre, but it was a thing like 15-20 years ago. Turns out though, the soapy taste it actually because of its distinctive rosewater flavour, so maybe this face cream really smells like rosewater. Either way, it reminds me of childhood - I'm a fan! I was actually in a pretty good position to test this face cream out when I first received it. We had just returned from vacation in Phoenix, and my skin was super sensitive after being subjected to the incredibly dry air in Arizona. I also had a run-in with a particularly bad skincare product while on vacation (*cough* Neutrogena Grapefruit Wipes *cough* - no seriously, never use them), and it left my skin stinging, a bit swollen, and definitely irritated. After giving the Mega-Mushroom Face Cream a try, it's like my skin was saying 'THANK YOUUUU!'. Moisturized and soothed, it was suddenly waaay happier. Before applying the Face Cream, you can also use the Treatment Lotion to soothe your skin. You take a cotton pad, soak it with the lotion (which comes out completely liquid), and pat it all over your clean skin. I'm not used to having this step in my routine, but I've come to really like it! It feels like a nice moisture boost after washing my face, and immediately calms it after exfoliating. You can use it morning and night, just like the Face Cream. I love a good Micellar Cleanser. I'm pretty lazy by nature, so a makeup remover I don't need to rinse off is always a plus. One that also calms irritated skin? Why not! I find it isn't quite as powerful as some of my other micellar cleansers, but if you have easily irritated skin, I'm sure you'd still prefer this one. It's soap and alcohol-free, and gently removes makeup and pollutants, while keeping your skin feeling comfortable and clean. Sundays were made for masking, and lately this Mega-Mushroom one has been my mask of choice. It goes on as a thin cream, then you leave it for 10 minutes. The formula contains Cordyceps and Reishi Mushrooms plus Ginger, Holy Basil and Turmeric to help calm and soothe the skin while reducing redness. This mask seems to really seep into the skin better than most - judging by how much the mask seems to disappear in that 10 minutes! By the end, from a distance, you might not even be able to see the mask on my face. Once the 10 minutes is up, you just use a tissue to wipe of the excess. It feels so pampering, and my skin is ready for another full week of, well, life! Disclaimer: Origins Canada provided the product used in this post for review. As always, opinions are entirely my own. Because BBQ Shouldn't Taste Like an Ashtray. By ... Clean wood fire produces clean, almost transparent smoke, which is ... The only way to fix it is to put it out completely, or add some drywood and get the flames .. Can you put wood chips directly on charcoal?